so silly that I absolutely must have it! Well the rationale goes something like that. 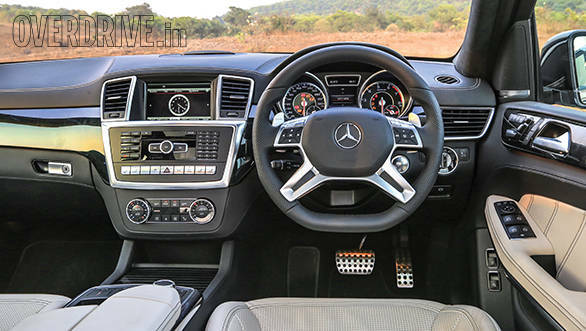 We'll admit it isn't a very strong argument but then again, all sanity gets flung out the window the very first time you floor the ML 63's throttle. 5.2s to 100kmph in a 2.4tonne, near six foot tall vehicle is nearly as obscene as the dirty and delicious V8 roar that blares out of the exhausts. 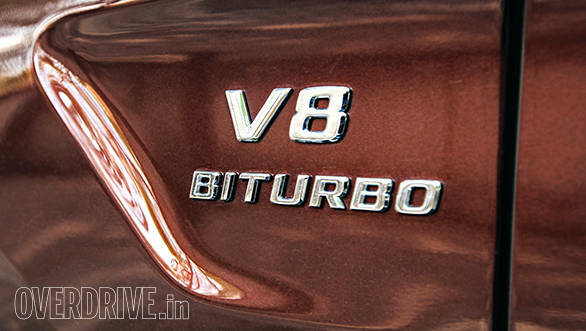 And the pace continues to build explosively with two turbos shoveling massive amounts of air into the 5.5-litre V8 bomb under the hood. It literally is explosive performance  stick it in Sport mode and the exhausts produce a loud bang on upshifts thanks to a sneaky process where a little unburnt fuel is introduced to a very hot exhaust system. Like I said, this is a hilariously, ridiculously fun vehicle. The engine is essentially the same one you'd find in most powerful Mercs these days. Internationally it's been detuned slightly from the 557PS GL 63 AMG to make 525PS at 6500rpm and 700Nm at 5200rpm. However India gets the AMG performance pack which bumps it right up to the GL 63's ridiculous 557PS/760Nm dropkick in the guts. The ML 63 AMG uses the (deep breath) AMG Speedshift Plus 7G-Tronic torque convertor auto from the SLK 55 AMG. Now this was a gearbox that irritated me significantly with its lazy upshifts in the SLK but it doesn't really matter so much in the ML and that's because you drive both cars in a very different fashion. The SLK is a sharp sports car that you want to grab by the collar and hustle through a mountain road with precise control over the gearbox. In the ML you simply enjoy surfing the enormous torque wave and leave the gearbox in auto mode. Besides which this particular gearbox seems to work best when left in Sport mode where it shifts intuitively and produces rev matched downshifts under braking for added stability and aural awesomeness. As you'd expect efficiency isn't a strong point  we got 6.2kmpl on the highway and anything above 4kmpl in the city will be a stretch. I briefly drove the GL 63 AMG a few weeks back and it's a startling experience, both in the way it accelerates and in the sheer mass it carries. The ML thankfully is smaller and weighs a lot lesser which means it's much nicer to drive. Keep the dampers in soft mode and the car settles into a supple set up where the suspension only gets agitated by sharper discrepancies in the road. The dampers offer two levels of stiffness. In most sports cars we'd suggest leaving them in Comfort because it gets far too stiff but in the ML 63 it helps corner flat and hard when in the stiffer modes on a good road. Steering feel is precise and the ML is a surprising pleasure on a winding road. The all wheel drive system generates so much grip that the ESP system doesn't have much to do unless you act silly with the throttle. Massive brakes haul the SUV to a secure stop with almost no complaint from the ABS system. All said and done, it's not shockingly dynamic like a Porsche Cayenne Turbo but is pretty good nonetheless. However the 63 is a master class on the highway with supreme straight-line stability and the ability to bully your way past any traffic regardless of how powerful they might be. 140kmph has the needle hovering at just 2500rpm and the 63 will hit its top speed of 250kmph with ease. Despite the firepower, the ML 63 is ironically quite a sleeper given that it looks very similar to a launch edition ML 350 CDI that came with a similar AMG body kit. Save for the slightly more aggressive front bumper, name badges on the rear and the super cool sounding 'V8 Biturbo' (reads so much better than 'twin turbo') detailing on the wheel arches a bystander wouldn't know the difference. 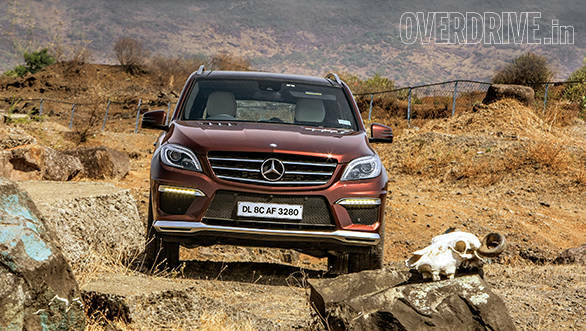 Even the most astute of enthusiasts won't notice the difference without looking closely at the five spoke wheels or at the signature AMG quad exhausts. Which by the way are fake  they're simply chrome fixtures in the bumpers with the real exhaust pipe ending a few inches behind them. The story is the same on the inside. Everything feels plush and luxurious, but aside from the AMG badging you wouldn't really know you're in something this special and expensive. So we've established that the ML 63 is awesome in the way that it tears tarmac off the countryside. And we've also established that you need to have a certain level of crazy in you to buy one. 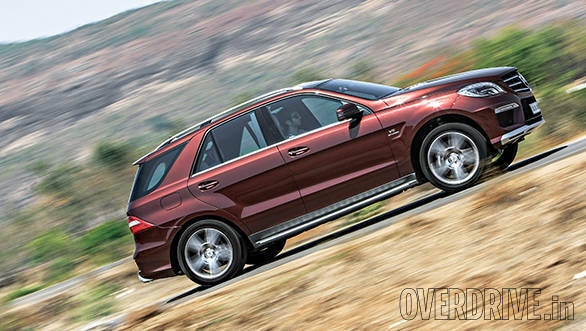 And that is where the ML 63 AMG finds it's only downside  it simply doesn't look wild or even distinctive enough. If you're going to spend Rs 1.5 crore (ex-showroom mind you) on one of these nutty machines why not go the whole hog and get yourself something truly outrageous? In fact Mercedes-Benz has the answer in its own similarly priced G63 AMG. A Gelandewagen with 544PS is quite possibly one of the silliest and thereby coolest vehicles in the world today. Go on, get crazy!